Figure A61. Mississippi anomaly, interpreted as the Mississippi slab, with (horizontal) [vertical] cross sections through (A)[D] the UUP07 p-wave) and (B)[D] the combined SL2013 and S40RTS s-wave models at 810 km; C) the location of the modern geological record that we interpret to have formed during the subduction of the slab. The Missisippi anomaly (Figure A61) is part of the set of anomalies commonly, and in our previous compilation in van der Meer et al. (2010), interpreted as the Farallon slab as originally defined by Grand et al. (1997). The NW-SE trending Mississippi anomaly has a central position within the family of Farallon anomalies and is located in the mid-mantle below Central North America and the northern Caribbean region. At its base it connects with the top of the N-S trending Hatteras slab. 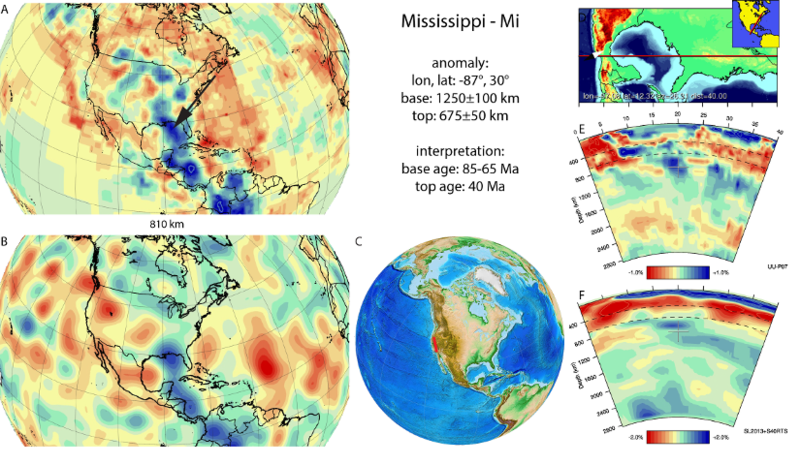 The Mississippi anomaly corresponds to the SF3 anomaly of Sigloch and Mihalynuk, (2013), who interpreted the transition of the Hatteras to the Mississippi slab to have happened when the South Farallon trench stepped westward after accretion of Shatsky Rise Conjugate plateau. This led to a slab window with Sonora volcanism including the Tarahumara ignimbrite province (85-65 Myr ago). We have adopted this as the start of subduction of the Mississippi slab. In the upper mantle, the slab disintegrates into smaller, dispersed fragments, which have been associated with subduction during the Laramide orogeny (80-40 Ma) (van der Lee and Nolet, 1997; Sigloch et al., 2008; Liu and Stegman, 2011). We have taken the end of the Laramide orogeny (40 Ma) as end of subduction of the slab.